A tart makes such a pretty presentation on a dessert table, especially this tart, which has slices of caramelized pears on top. The skin of a Bosc pear is autumn-hued in lovely shades of brown and gold, which is precisely why the pears are left unpeeled. 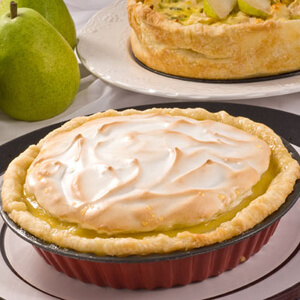 The tart can be made in stages: the tart shell can be prepared in advance and frozen, and the filling can be made a day ahead. This makes assembly and baking a breeze. For crust: Combine the hazelnuts, flour, salt, and sugar in a food processor fitted with the metal blade. Add the butter and shortening and pulse until the mixture resembles coarse meal. Add the sour cream and water, and process for a few seconds, just until a ball of dough begins to form. Do not overprocess. (To make the dough by hand, place the dry ingredients in a large bowl, and use a pastry blender to cut the butter and shortening into the flour mixture. Add the sour cream and ice water, and mix just until it comes together and forms a mass.) Transfer the dough to a floured work surface, gathering all the loose bits, and form into a disk about 1 inch thick. Wrap the dough in plastic wrap, and refrigerate for at least 30 minutes, or overnight. For filling: Cream the butter and sugar in a food processor fitted with the metal blade, stopping the machine once or twice to scrape down the sides of the work bowl. Add the egg yolk, egg, and heavy cream, and process to blend thoroughly. Scatter the ground nuts and flour over the butter mixture, and process just until blended. Refrigerate while preparing the pears. Halve and core them and cut vertically into ⅛-inch slices. 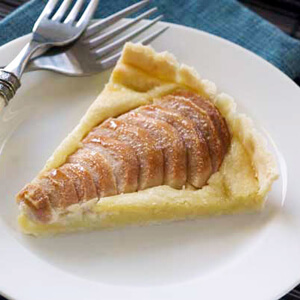 To assemble: Spread the cream filling evenly over the bottom of the prepared tart shell. Arrange the pears over the filling in overlapping concentric circles, starting from the outside edge and working toward the center. Brush the pears with the pear brandy. Sprinkle the 1 ½ tablespoons of sugar over the top. Prepare the ground hazelnuts for both the tart shell and filling at the same time. Spread 1 cup of hazelnuts on a rimmed baking sheet and roast them in a preheated 350 degree oven until lightly browned, about 10 minutes. Rub the nuts together in a terry kitchen towel to remove the skins. Place them in a food processor fitted with a metal blade and process until finely ground. Measure and set aside ¼ cup for the tart shell, and ½ cup for the filling. This recipe is from The Thanksgiving Table: Recipes and Ideas to Create Your Own Holiday Tradition by Diane Morgan. Provided courtesy of Diane Morgan and reproduced with permission by Pear Bureau Northwest.